I thank Mrs Sindaca for the welcome invitation and for the kind expressions she addressed to me. My cordial greeting extends to the Councilors, the Councilors of the Municipality, the Representatives of the Government, the other Authorities present and all the Roman citizenship. For some time I wanted to come to the Campidoglio to meet you and bring you my personal thanks for the collaboration given by the city authorities to those of the Holy See on the occasion of the Extraordinary Jubilee of Mercy, as well as for the celebration of other ecclesial events. In fact, for their orderly execution and their success they need the availability and the qualified work of you, administrators of this City, witness of a millennial history and that, welcoming Christianity, has become over the centuries the center of Catholicism. Rome is the home of an original conception of law, modeled on the practical wisdom of its people and through which it radiated the world with its principles and institutions. It is the City that has recognized the value and beauty of philosophy, art and in general of the culture produced by ancient Ellade and has accepted it and integrated it to the point that the civilization that arose from it has rightly been called Greco-Roman . At the same time, by a coincidence that it is difficult not to call drawing, here the Holy Apostles Peter and Paul crowned their mission with martyrdom, and their blood, combined with that of many other witnesses, became the seed of new generations of Christians. They have contributed to giving the city a new face, which, despite the tangle of alternating historical vicissitudes, with their dramas, lights and shadows, still shines today with the wealth of monuments, works of art, churches and palaces, all placed in an inimitable way on the seven hills, of which this is the first. Rome, over its nearly 2,800 years of history, has been able to welcome and integrate different populations and people from all over the world, belonging to the most varied social and economic categories, without canceling their legitimate differences, without humiliating or crushing their respective peculiar characteristics and identity. Rather, he lent each of them fertile ground, that humus suited to bringing out the best of each and giving shape - in mutual dialogue - to new identities. This city has welcomed students and pilgrims, tourists, refugees and migrants from every region of Italy and from many countries of the world. It has become a pole of attraction and a zipper. Hinge between the continental north and the Mediterranean world, between the Latin and the Germanic civilizations, between the prerogatives and the powers reserved to the civil powers and those proper to the spiritual power. Indeed, it can be affirmed that, thanks to the strength of the Gospel words, that provident distinction was inaugurated here, in mutual and collaborative respect for the good of all, between civil and religious authority, which better conforms to the dignity of the human person and offers spaces of freedom and participation. Rome has therefore become a destination and symbol for all those who, recognizing it as the capital of Italy and the center of Catholicism, have set off towards it to admire its monuments and traces of the past, to venerate the memories of the Martyrs, to celebrate the main feasts of the liturgical year and for the great Jubilee pilgrimages, but also to lend their services to the institutions of the Italian nation or of the Holy See. Rome, therefore, in a certain sense obliges temporal and spiritual power to dialogue constantly, to collaborate on a stable basis in mutual respect; and it also requires being creative, both in the daily weaving of good relationships, as in dealing with the many problems, which the management of such an immense inheritance necessarily carries with it. The "Eternal City" is like a huge treasure trove of spiritual, historical-artistic and institutional treasures, and at the same time it is the place inhabited by about three million people who work, study, pray, meet and carry on their story personal and family, and that together are the honor and the effort of every administrator, of anyone who works for the common good of the city. It is a delicate organism, which needs humble and assiduous care and creative courage to maintain order and livability, so that so much splendor is not degraded, but to the accumulation of past glories we can add the contribution of the new generations, their specific genius, their initiatives, their good projects. The Capitol, together with the Michelangelo's Dome and the Colosseum - which from here you can see - are in a sense the emblems and the synthesis. In fact, all these vestiges tell us that Rome has a universal vocation, the bearer of a mission and an ideal suitable for crossing mountains and seas and to be told to everyone, near and far, to any people they belong, whatever language they speak and whatever the color of their skin. As the See of the Successor of St. Peter, it is a spiritual reference point for the whole Catholic world. Therefore it is well explained that the Agreement between Italy and the Holy See on the Concordat - of which this year celebrates its 35th anniversary - affirms that «the Italian Republic recognizes the particular significance that Rome, episcopal see of the Supreme Pontiff, has for catholicity "(art. 2 § 4). This peculiar historical, cultural and institutional identity of Rome requires that the Capitoline Administration be able to govern this complex reality with appropriate regulatory tools and a fair amount of resources. Even more decisive, however, is that Rome remains up to its tasks and its history, that it knows even in the changed circumstances of today to be a beacon of civilization and a teacher of welcome, that does not lose the wisdom that is manifested in the ability to integrate and to make everyone feel a full participant in a common destiny. The Church in Rome wants to help the Romans to rediscover the sense of belonging to such a peculiar community and, thanks to the network of its parishes, schools and charitable institutions, as well as to the wide and commendable commitment of volunteering, it collaborates with the powers civilians and all citizens to keep this city its most noble face, its feelings of Christian love and civic sense. Rome demands and deserves the active, wise, generous collaboration of all; deserves that both private citizens such as social forces and public institutions, the Catholic Church and other religious communities, all place themselves at the service of the good of the city and of the people who live there, especially those who for whatever reason find themselves in the margins, almost discarded and forgotten or that experience the suffering of illness, abandonment or loneliness. Forty-five years have passed since the convention which had the title: "The responsibilities of Christians in the face of expectations of charity and justice in the Diocese of Rome", better known as the Convention "on the evils of Rome". It undertook to translate the indications of the Second Vatican Council into practice and enabled the real conditions of the urban peripheries, where masses of immigrants from other parts of Italy had arrived, to be faced with greater awareness. Today those and other suburbs have seen the arrival, from many countries, of numerous migrants who have fled wars and poverty, who seek to rebuild their existence in conditions of security and dignified life. Rome, a hospitable city, is called to face this epochal challenge in the wake of its noble history; to use its energies to welcome and integrate, to transform tensions and problems into opportunities for meeting and growth. Rome, fertilized by the blood of the Martyrs, knows how to draw from its culture, shaped by faith in Christ, the resources of creativity and charity necessary to overcome the fears that risk blocking the initiatives and possible paths. These could make the city flourish, unite and create opportunities for development, both civic and cultural, as well as economic and social. Rome, city of bridges, never walls! Do not fear goodness and charity! They are creative and generate a peaceful society, able to multiply forces, to tackle problems with seriousness and with less anxiety, with greater dignity and respect for each one and to open up new opportunities for development. The Holy See wishes to collaborate ever more and better for the good of the City, at the service of all, especially the poorest and most disadvantaged, for the culture of encounter and for an integral ecology. It encourages all its institutions and structures, as well as all the people and communities that refer to it, to actively engage in witnessing to the efficacy and attractiveness of a faith that becomes work, initiative and creativity at the service of the good . I therefore express the best wishes for everyone to feel fully involved in achieving this goal, to confirm with the clarity of ideas and the strength of daily witness the best traditions of Rome and its mission, and why this favors a moral and spiritual rebirth of the City . 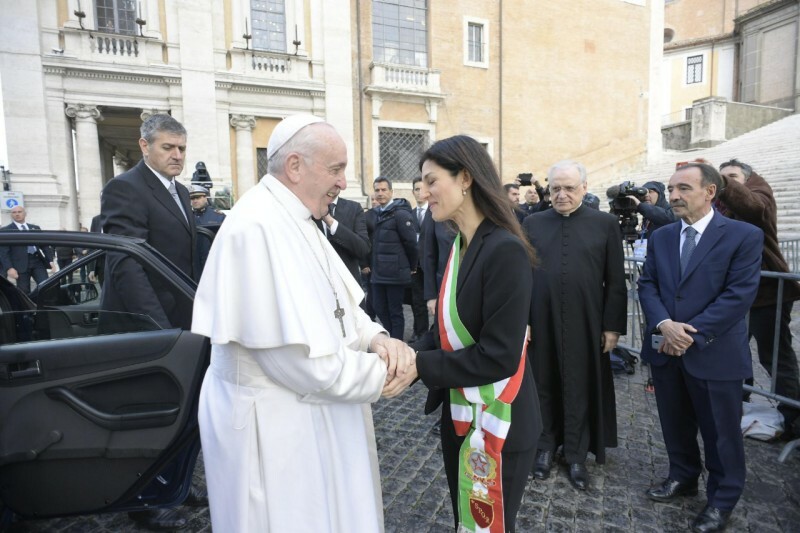 Madam Mayor, dear friends, at the end of this talk of mine, I want to entrust each of you, your work and the good intentions that animate you, to the protection of Maria Salus Populi Romani and the patron saints Pietro and Paolo. May you agree in the service of this beloved City, in which the Lord has called me to carry out the episcopal ministry. Upon each of you I cordially invoke the abundance of divine blessings and assure you of a remembrance in prayer. And you pray for me and if any of you don't pray, at least think well of me! Thank you very much! As your Bishop I usually meet you in St. Peter's, in St. John's or in the parishes ... Today I was able to address you the word and the greeting from the Capitol, cradle of this City and the beating heart of its administrative and civil life. Thank you for your presence and thanks for the love you have for the Successor of Peter! The Church in Rome, according to the well-known expression of Saint Ignatius of Antioch, "presides over charity" (Letter to the Romans, Proemio). Therefore it is the duty of his Bishop, the Pope, but also of all the Christians of Rome, to work concretely to keep the face of this Church always luminous, reflecting the light of Christ who renews hearts. In the heart of the Pope there are also those who do not share our faith, they are all brothers: for all it is my spiritual closeness, and my encouragement to be "artisans" of fraternity and solidarity every day. This is the task of a citizen: to be a craftsman of fraternity and solidarity. Like so many people around the world, you too, citizens of Rome, are concerned about the well-being and education of your children; you care about the future of the planet, and the kind of world we will leave for future generations. But today, and every day, I would like to ask each of you, according to your abilities, to care for each other, to stay close to each other, to respect each other. Thus you embody in yourself the most beautiful values ​​of this City: that is, a united community that lives in harmony, that acts not only for justice, but in a spirit of justice. Thanks again for this meeting! I ask the Lord to fill you with his graces and his blessings. And I ask you, please, to pray for me. Thank you and goodbye! at the end of my visit to the Campidoglio, I am pleased to greet you who are, in a certain sense, the backbone of the municipal organization. I thank you for your welcome and I am grateful for all that you have done to prepare for this day. Most of the work you do is not in the news. None of you makes the news but you do things that support you. Behind the scenes, your daily commitment makes possible the ordinary activity of the Municipality in favor of the citizens and the many visitors who come to Rome every day. With your work, you strive to meet the legitimate needs of Roman families, which in many ways depend on your concern: be aware of so much responsibility! You are field workers, officials, employees in various offices and multiple departments of the public administration, cleaners, maintenance and security personnel. Thanks for everything you do! Your silent and faithful work contributes not only to the improvement of the City, but also has great significance for you personally, because the way we work expresses our dignity and the kind of people we are. I encourage you to continue your activity in the service of the City of Rome, its inhabitants, tourists and pilgrims with generosity and trust. I will pray for you and your families; and I ask everyone to remember to pray a little for me. God bless you all. Thank you.